Dry fire is arguably the most important thing you can do to improve your shooting skills. Like many of you, I own a Glock handgun. And, like many of you, I dry fire several times a week. Whether I'm just working on my draw and presentation, trigger press, tactical movement or something similar, I am constantly keeping my skills sharp and fluid. AND like most of you, I wish I could dry fire without having to re-rack the slide after every trigger pull. Well, while scouring the internet for new training concepts and aids, I came across a product that caught my eye. 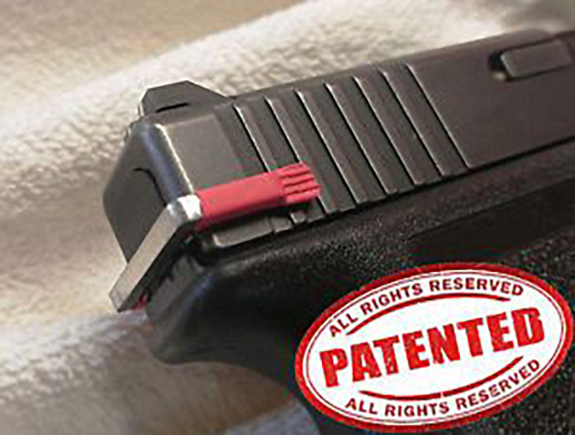 It is called the “Glock-E-Trainer,” and it is designed to allow you to dry fire your Glock handgun without having to re-rack the slide every time. There are many devices that do similar things, but I was intrigued by the simplicity of this device so I dug a little deeper. This dry fire training tool was invented by a gunsmith living in Greece by the name of Georgios Anastasopoulos. I contacted him and fortunately, he spoke English well, because I don't speak a word of Greek. Georgios sent a Glock E-Trainer to me from Greece, and I anxiously awaited its arrival. Sometimes when you buy products from overseas companies, there is an apprehension that it may be some sort of scam. I can say that it isn't the case here, and about 10 days later I had my Glock E-Trainer in the states. Today the product is available directly from ConcealedCarry.com who has secured the US Distribution rights. As someone who values dry fire as an invaluable piece of training, I wanted to test it out right away and see exactly how it worked. I found the ability to pull the trigger and not have to re-rack the slide each time useful! It is always somewhat frustrating to re-rack after every trigger pull. As much as I loved the ability to have the trigger to return to the forward position, there are some things to consider about the Glock E-Trainer. First, because of the way it disables the striker, it does not allow for the trigger to have the same exact feel as it does without the device being installed. There is also no ‘take up' and no ‘break' where the striker is released. This doesn't allow the shooter to get the exact feel of their trigger if they are trying to practice trigger control or get a feel for how their trigger performs. Another thing to note is that while you could theoretically rack the slide with the device installed, it does not clip on extremely tight, so there could be some movement of the device if you are working on immediate action drills or something similar. 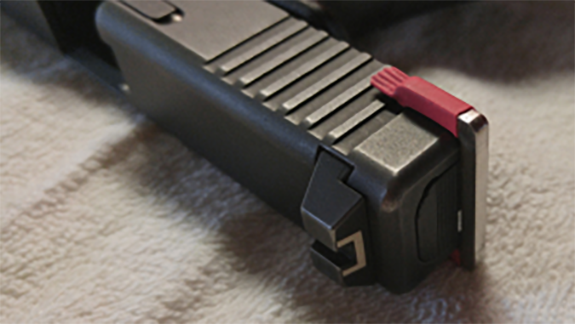 The Glock E-Trainer is very simple to install and doesn't require any tools at all. It is good if you are simply working on your draw or magazine change and want to include a trigger squeeze into your drill without having to re-rack as part of the drill. While there may be some people that are turned off by the lack of realistic trigger pull feel, I think that for certain applications the Glock E-Trainer can be a great little device to supplement your dry fire. Yes, right now this device is only for Glock handguns. I know there are some innovative readers out there who at this very moment are thinking of ways to produce similar devices for other manufacturers. What ways do you ensure you are getting enough training? For more information: Glock E-Trainer. AGREED! Dry fire practice is a very important way to improve your skills which translates to the live fire range nicely. This method looks enticing and I would love to try one. I carry a Glock 27, Gen. 4.